WASHINGTON — President Obama could leave office with the most aggressive, far-reaching environmental legacy of any occupant of the White House. Yet it is very possible that not a single major environmental law will have passed during his two terms in Washington. Instead, Mr. Obama has turned to the vast reach of the Clean Air Act of 1970, which some legal experts call the most powerful environmental law in the world. Faced with a Congress that has shut down his attempts to push through an environmental agenda, Mr. Obama is using the authority of the act passed at the birth of the environmental movement to issue a series of landmark regulations on air pollution, from soot to smog, to mercury and planet-warming carbon dioxide. The Supreme Court could still overturn much of Mr. Obama’s environmental legacy, although the justices so far have upheld the regulations in three significant cases. More challenges are expected, the most recent of which was taken up by the court on Tuesday. The act, however, was designed by lawmakers in a Democratic Congress to give the Environmental Protection Agency, which was created at the same time, great flexibility in its interpretation of the law. 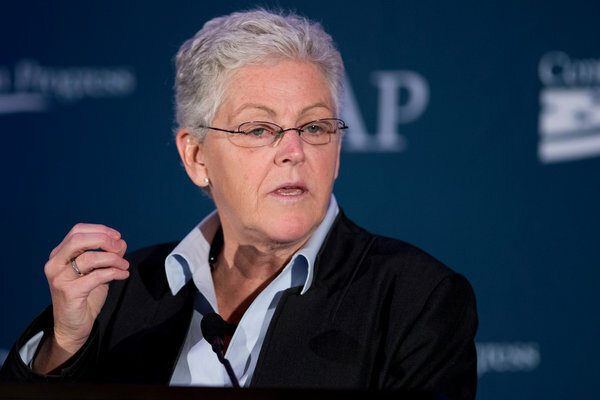 Gina McCarthy, the E.P.A. administrator, credits the act for the authority that Mr. Obama claims in setting environmental policy. “The administration is relying very heavily on this tool that Congress provided us 44 years ago,” she said. Taken together, the Clean Air Act regulations issued during the Obama administration have led to the creation of America’s first national policy for combating global warming and a fundamental reshaping of major sectors of the economy, specifically auto manufacturing and electric utilities. The regulations could ultimately shut down existing coal-fired power plants, freeze construction of new coal plants and end demand for the nation’s most polluting fuel. Mr. Obama’s most recent regulation, proposed on Wednesday, would reduce ozone, a smog-causing pollutant that is created by emissions from factories and coal plants and is linked to asthma, heart disease and premature death. That regulation is the latest of six new rules intended to rein in emissions of hazardous pollutants from factory and power-plant smokestacks, including soot, mercury, sulfur and nitrogen oxide. The most consequential regulations are those that cut emissions of carbon dioxide, the gas dispersed from automobile tailpipes and coal plants and which contributes to global warming. More rules are on the way: By the end of the year, the E.P.A. is expected to announce plans for regulating the emission of methane at natural gas production facilities. Republicans and industry leaders have fought back against the rules, attacking them as “job-killing” regulations. “The Clean Air Act is a direct threat,” said Hal Quinn, president of the National Mining Association. Among the fiercest critics is Senator Mitch McConnell, Republican of Kentucky, who is expected to take over as majority leader in the next Congressional term and whose home state is a major producer of coal. Mr. McConnell has vowed to put forth legislation to block or delay the administration’s regulations. Although the E.P.A. regulations are today the target of Republican ire, in 1970 the Clean Air Act passed with overwhelming bipartisan support, clearing the Senate with a vote of 73 to 0. President Richard M. Nixon, a Republican, signed the bill into law. “The idea was to give E.P.A. broad authority, making sure that it had tools to exercise this authority,” said Robert Nordhaus, an environmental lawyer who, as a staff lawyer in the House legislative counsel’s office, helped draft the law. Today Mr. Nordhaus is a senior partner at the environmental law firm Van Ness Feldman. The 1990 iteration of the Clean Air Act also included requirements that the E.P.A. issue, and periodically update, regulations on pollutants such as ozone and mercury. Some of Mr. Obama’s new regulations are a result of that requirement. Mr. Obama, however, is the first president to use the law to fight global warming. After trying and failing to push a new climate-change law through Congress aimed at curbing greenhouse gas pollution, the president went back to the Clean Air Act. The E.P.A. issued a Clean Air Act regulation in Mr. Obama’s first term. The agency required automakers to comply with tough new vehicle fuel-economy standards of 54.5 miles per gallon by 2025. The regulations compelled the auto industry to research and develop hybrid and electric vehicles. Those requirements alone are expected to lead to a major reduction of carbon pollution in the coming decades. Next year, the E.P.A. is to finalize two regulations aimed at limiting pollution from new and existing coal-fired power plants. Once they are enacted, the regulations could eventually transform the way electricity is produced, transmitted and consumed in the United States, leading to more power generation from alternative sources like wind, solar and nuclear. But the regulations could also cause costly disruptions in power reliability and transmission, forcing companies to look for breakthroughs in technology to meet the requirements. An article on Thursday about President Obama’s new environmental regulations misstated how ozone gets into the air. Ozone is a smog-causing pollutant created by emissions from factories and coal plants; it is not itself emitted into the air. The error also occurred in an article and headline on Wednesday about the announcement of the regulations.